This is an exciting development in digital landscape interpretation, I wonder how it could be used with school groups across the South Downs. Today, I was lucky enough to take part in a seminar with the Capability Brown Festival 2016 at Petworth House. Janet Sinclair, House and Collections Manager at Petworth House, and Tom Dommett, Senior Archaeologist for the National Trust, demonstrated two new innovative approaches to helping visitors access information about the history of Petworth Park. Info-point is a standalone Wi-Fi system that delivers fun facts, video and audio directly to users mobiles, tablets and devices. The Wi-Fi hotspots are discretely placed around the grounds, providing free, safe and secure access to fascinating resources. I could stand outside, looking at today’s Capability Brown landscape, while my phone displayed images of how it looked in the past. Inside the house, I got my hands messy in the Interactive Sandbox, shifting sand about while a projector scanned the contours and overlaid a topographical map on my newly created landscape. Building sandcastles may never be the same again! It’s early days. Petworth Park is the first National Trust property to have a go at using info-point technology. The Wi-Fi units at Petworth are fixed in place, but you could run a unit with a small battery and carry it around in a backpack. There is great potential for new and interesting ways to engage school groups learning outdoors. It has certainly inspired me and has got me thinking about how I might be able to use this technology in the future! 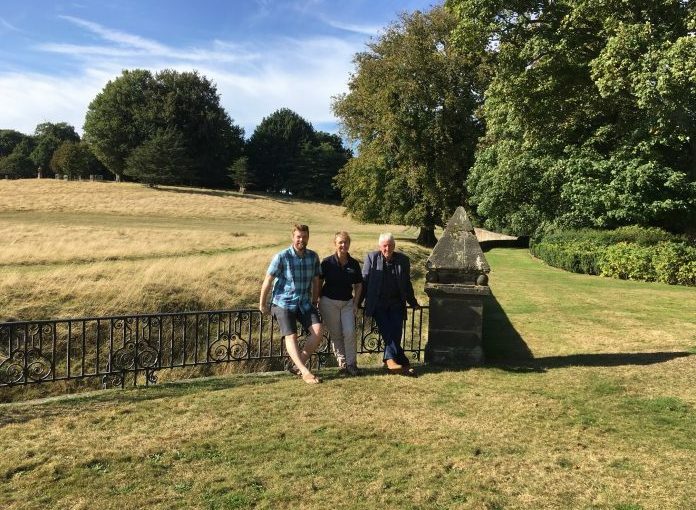 Photo: me, Allison (our Access and Recreation Strategy Lead), and Ian (one of our members) sitting beside the Ha-Ha, looking out over Capability Brown’s landscape from Petworth House.